This little recycling project reuses plastic or metal bottle caps to make frames for pictures cut from old Christmas cards. Children should be able to complete the craft quite easily. 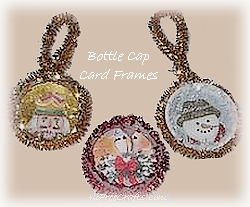 You can add a hanger to use these bottle cap picture frames as tree trims or glue on a magnet to make Christmas fridgies. 1. Collect a number of shallow metal or plastic bottle caps, such as those that are used on plastic water bottles or prescription pill bottles. 2. You will also need a selection of Christmas cards that have fairly small pictures that you can cut out. You may be able to make several tree trims from one card. 3. Center a bottle cap over a picture that you like – this might be the face of Santa or a snowman, or some other part of a Christmas scene. Trace around the bottle cap with a pencil. 4. The pencilled circle will be a little too big to fit into your bottle cap, so when you cut it out, go inside the circle a little bit. Test to see if the picture can be pushed easily into the bottle cap. Trim it, if necessary, to make it fit. Put a dab of glue inside the bottle cap and press the picture into place. 5. Take a chenille stem and wrap it around the edge of the bottle cap, twisting the two ends together at the top. Cut off the ends if you want to make a fridgie. If you’re making a tree trim, twist the two ends into a loop and trim off any excess. 6. Dab a little white glue around the inside of the bottle cap rim. Add a little more glue on top of the rim. 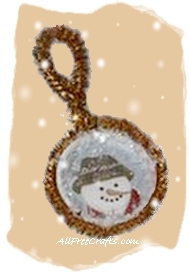 Put the bottle cap in the middle of an old opened Christmas card and shake glitter over the glued area. Shake the bottle cap to release any extra glitter and set aside to dry. You can save the extra glitter by folding the card together a little bit and funnelling the glitter back into its bottle. 7. If you’re making a Christmas fridgie, glue a magnet to the back and stick on the fridge, or on your locker at school.